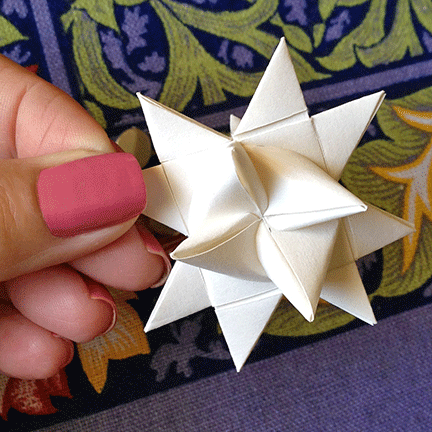 Here’s my very first self-folded German paper star! I learned the technique from watching the video tutorial that I mentioned yesterday. I seriously doubt that I’ll ever give my big sister a run for her money in either output or speed in crafting these, but it was fun to learn how to make these little gems. I also started my new cross stitch project yesterday. I only managed a few stitches in one of the flowers, but it felt really good to be putting floss to fabric again. Since I’d never made one of these before, I watched the tutorial through once and then played it again while I folded my star. Try it, it’s fun! These are really fun to make once you master the technique. It is a good project for television nights. I often buy my strips when I visit Pennsylvania Dutch country, but Starcraft on Etsy sells gorgeous papers in many colors. I have also cut my own strips using the electronic paper trimmer at work that measures the strips. The trick in cutting your own paper is to be as accurate as possible as uneven strips make folding a problem. Have fun!